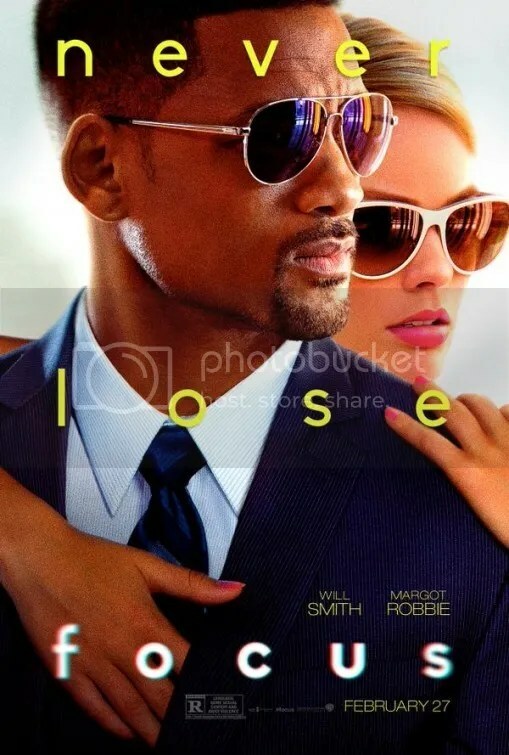 Seasoned con man Nicky Spurgeon (Will Smith) takes inexperienced protégé Jess Barrett (Margot Robbie) under his wing to teach her the art of the grift. You’d think the fact that Smith is Robbie’s senior by two decades might give them a more father-daughter relationship but you’d be wrong. Robbie is stunning and Smith is still famous so naturally the two are fated to fall in love. Or do they? The problem with Focus is that you never quite believe anything that is happening on the screen. It’s one of those “who’s cheating who” type deceptions. There’s genuine skill in creating the perfect con that the best films (The Sting, Dirty Rotten Scoundrels, Catch Me If You Can) understand. There is a delicate balance between a grounded tale and a twisty fraud. Unfortunately this chronicle is so artificial, there’s nothing to count on. The many eye-rolling moments kill interest in this deception. Focus is a glossy bit of entertainment, but it’s all a con. It’s crucial to your enjoyment that you enjoy the sexual chemistry that Smith and Robbie are trying so hard to ignite. Robbie is game but Smith lacks the suave demeanor required to really pull this off. He’s no Cary Grant. He’s not even Jim Carrey. There was a time where Smith could pull off charming. He had it in Hitch. But he doesn’t even exude the warmth necessary to even like him as a human being. Smith comes across as more smug – coolly detached to everyone and everything. He’s more in love with himself than his beautiful young co-star. With the romance falling flat there’s just the haphazardly constructed “big job” in the second half to hold our interest. A keen viewer will disregard everything in this subterfuge with a discerning eye. The story never earns our trust. It fails to engage – with one notable exception. Early on Nicky meets a compulsive gambler while attending a football game. B. D. Wong plays the wealthy businessman with fiendish glee. Their escalating back and forth double or nothing betting is the single most delightful scene in the entire film. For a brief moment, the movie comes alive. Too bad it loses focus. This entry was posted on March 4, 2015 at 3:51 pm and is filed under Comedy, Crime, Drama with tags 2015. You can follow any responses to this entry through the RSS 2.0 feed. You can leave a response, or trackback from your own site. When I first left this I was almost offended by the stupidity/predictability of its final con bit that actually tapered off into reluctant acceptance. I felt a bit more generous towards Will Smith but I can totally see how his nonchalance turned you off. Great work Mark. He’s become almost insufferable. The guy is great at portraying a pampered star but he hasn’t created a likable character since The Pursuit of Happyness. I liked it ok. At times, Unfortunate close-ups had Will Smith looking like Morgan Freeman. The age difference was ridiculous. If there was chemistry between the two, maybe I wouldn’t have minded, but I didn’t buy it. The cons were fun, but not enough. Yeah they should’ve used a SOFT focus lens in his close ups. Your review is exactly what I thought when I first saw the trailer 6 months ago. It just looked like Will Smith was imitating a character from the Ocean’s franchise, but not becoming an original, or fresh character; this one just looked generic and recycled. I appreciate you taking one for the team and going to watch it and jot a review; had you recommended it and said it was better than expected, I would have considered giving it a watch…because I was sooo hoping I was wrong about this one and would surprise. Sometimes, I hate it when I’m right. lol. I’d rather be wrong like I was about “Nightcrawler”. When I first saw that trailer I thought it looked a little bland, but after seeing the positive reviews I went to see it. And glad I did. I approached it with an open mind. Sadly Smith lacks the likability needed to sell this romance which is a HUGE part of the story. His personality is just arrogance without any hint of a sense of humor. Yeah, Will Smith’s losing streak continues. I felt that he was either detached or not fully invested. He wasn’t bad, but he was far from good. As for Margot Robbie – she stole the picture, or should we say Smith allowed her to. One could also think that the filmmakers did themselves in by weakening the big con by diluting with the the big romance which itself seemed like a con. We ended our reviews you in similar fashion. You wrote: Too bad it loses focus. I wrote: Focus will likely sell tickets – the hard truth of this con artist film is that the film makers decidedly lost their focus. Agreed that the best scene was the one with BD Wong and that Robbie is one to watch. Next up for B.D. Wong? Jurassic World! I kind of wanted to see this but Mr O is having none of it. Wonderful post. I must say that I was immersed through the masterfully done Super Bowl job, but once the scene shifted to Argentina, I lost complete interest in the film. And with most con movies, at some point it is hard to feel anything because the viewer knows it likely means nothing. Focus built an intriguing premise and held attention right up to the point you mentioned, but the ending was terrible. And unfortunately that’s the last thing you remember. Mark drops the mic and leaves the stage. Ha ha. Glad you enjoyed that. I’d also have a hard time buying into Smith and Robbie as a couple. I’ve heard from several people that it’s pretty unbelievable overall and fails to pull you in due to their lack of chemistry. If I see it, it would just be to take in B.D. Wong’s portion of the movie because I feel like I never get to see him do anything outside of Law and Order SVU. Yeah he’s very good in this. I remember him also in the HBO TV series Oz.